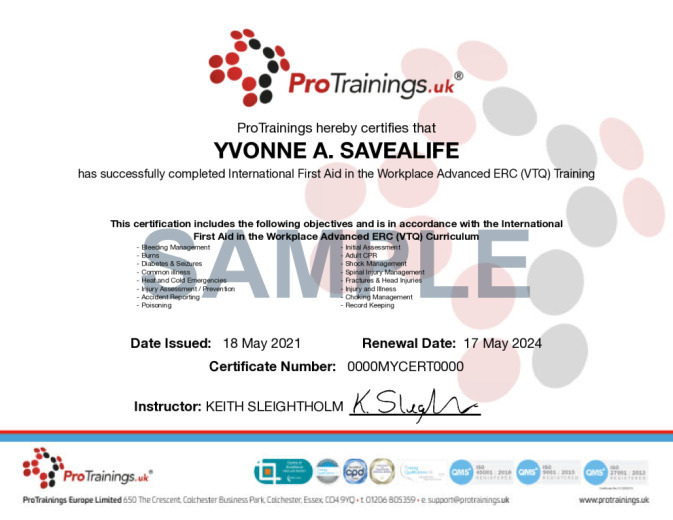 The ProTrainings International First Aid at Work Advanced qualification is ideal for most businesses whose risk assessment has identified that they require a fully trained first aider for their workplace. This course is mapped to regulated first aid at work level 3 qualifications. If you require a UK HSE FAW course, please visit our First Aid at Work UK site. This course comes with 7.0 hours of CPD, although the time to complete the course online may be less than this. Total course time includes 5 hours and 34 minutes of video training as well as knowledge reviews, final test, remedial help and reviewing downloaded material.